The Central North Island is a vast area, incorporating numerous outlets for any adventure-minded person. Mt Ruapehu and the central volcanoes are ground zero for mountaineers in the North Island and offer spectacular alpine, ice climbing, rock climbing, skiing and ski touring opportunities. 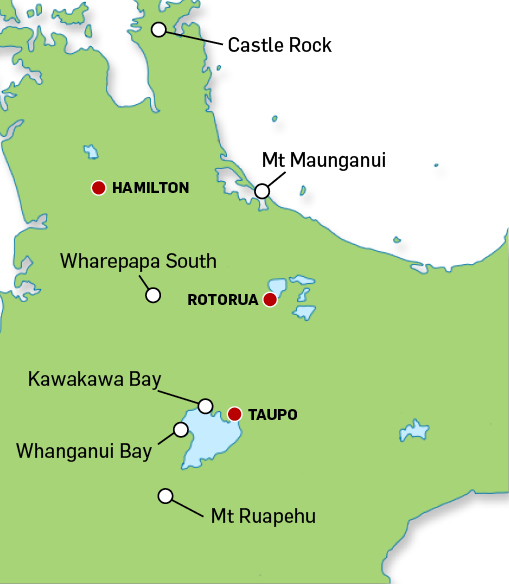 Numerous high-quality crags abound from Waikato in the north to Kawakawa Bay to Whanganui Bay. The Central North Island (CNI) Section of the New Zealand Alpine Club was established in 1987, it includes the Coromandel, Bay of Plenty, Waikato and Taupo. The Central North Island and Auckland Sections are responsible for the Ruapehu Hut maintenance programme. Central North Island also has the main responsibility for the upkeep of Whangaehu Hut.